FIRST truck using arrows to direct cars around a crash to keep traffic moving. The primary purpose of the FIRST program, formerly known as Highway Helper program, is to minimize congestion and prevent secondary crashes through the quick response and removal of incidents. 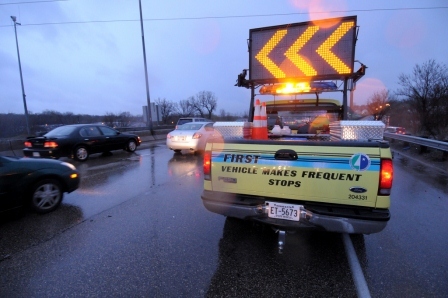 About half of the traffic congestion on Twin Cities freeways is caused by incidents such as crashes, stalled vehicles or debris in the roadway. These incidents also cause about 15 percent of freeway crashes. The FIRST program is a key component of the Metro Area's Incident Management Program. Reduce congestion by locating, assisting, and removing stalled vehicles, crashes and debris from freeway lanes. Aid State Patrol with traffic control and scene security at crash scenes - FIRST trucks are outfitted with portable message boards as seen in the pictures below. Support State Patrol with first aid at crash scenes- FIRST personnel are trained as EMS First Responders. Push disabled vehicles out of the traffic lanes and assists in removing debris- all FIRST trucks have push-bumpers to remove vehicles from the traffic lanes. When are FIRST trucks on the road? FIRST trucks patrol eleven routes, covering 220 miles of metro area freeways. They are on the roads from 3:30 a.m. to 9:00 p.m. Monday through Friday, with limited coverage on the weekends. How do they know when to respond to an incident? 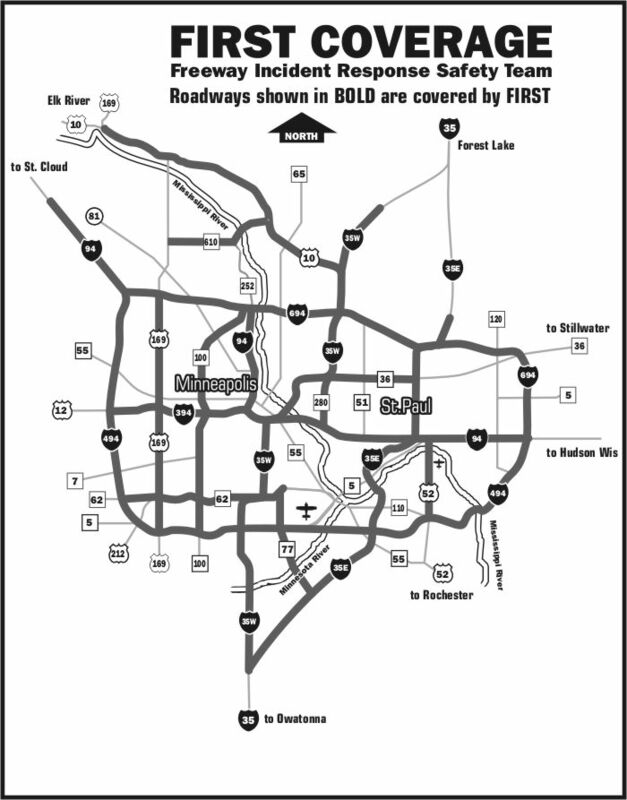 FIRST are dispatched by the MnDOT's Regional Transportation Management Center (RTMC). The dispatcher uses a Global Positioning System to track FIRST vehicles and can find the closest vehicle to an incident so they can respond as quickly as possible. For more information about the FIRST program, check out our background page.